Being quite isolated means we Australians can often get so awe-struck by exotic overseas locations that we forget about some of the amazing stuff we have right here in our own backyard. Case in point—the Barossa Valley. This world-renowned wine region is recognised as producing some of the best wine on the planet (if you haven’t seen the doco Somm, go and watch it immediately), it has won more international awards than you can poke a grapevine at, and it attracts visitors from all over the globe eager to sample its big bold shirazes. And what do you know—it's in South Australia, a short trip for most of us. So next time you’re thinking about spending your long weekend in Bali, head to this Australian treasure instead. Here’s how to do 48 hours in the Barossa. Start your Barossa adventure with a wine tasting with the masters of tawny fortified, Seppeltsfield Wines. Not many wineries could say that they’ve helped shape the history of Australia’s wine industry; or that they’re one of the most awarded wineries in the country; or that they’re the only winery in the world to release a 100-year old wine every year. Unless, of course, that winery is Seppeltsfield. All of those kudos aside, the wine here is excellent, the staff are full-bottle (excuse the pun) on the region and its history, and the whole place is visually magnificent. Once you’re done with your tasting, head to the Seppeltsfield Centennial Collection cellar. You can experience this spectacular cellar where they have been barrel-aging their 100-year old wine since 1878, and even try wine from your birth year. After all that you’ll be pretty hungry, so head to Seppeltsfield’s restaurant Fino for lunch. This place serves up generous food designed to be shared and is all made with seasonal produce from the Barossa region. After that, head to Tomfoolery Wines, the epitome of a hidden gem. Tomfoolery looks fairly unassuming on approach. The staff are so relaxed you'll want to invite them over for dinner and the whole place has a chilled out, unpretentious vibe about it (likely because the winery was started by two young best mates). But don't let any of that give you the impression these guys don't mean business—Tomfoolery’s wines pack a punch. The Son Of A Gun cabernet sauvignon is spectacular and the Black & Blue shiraz will make you cry real tears of joy. Pack your credit cards. As if the Barossa wasn't good enough, it is also the home of everybody’s dream grandma, Maggie Beer. Which means there is obviously a Maggie Beer Farm Shop in the region. Make your way there in the afternoon to buy all the cheese, crackers and goodies you can afford, go home and crack them all open along with the wine you bought. Kick off your day with a trip to Artisans of the Barossa. The one building houses the cellar door of six individual small-batch winemakers and there is a delightful tasting room for you to sample the fruits of their labour. 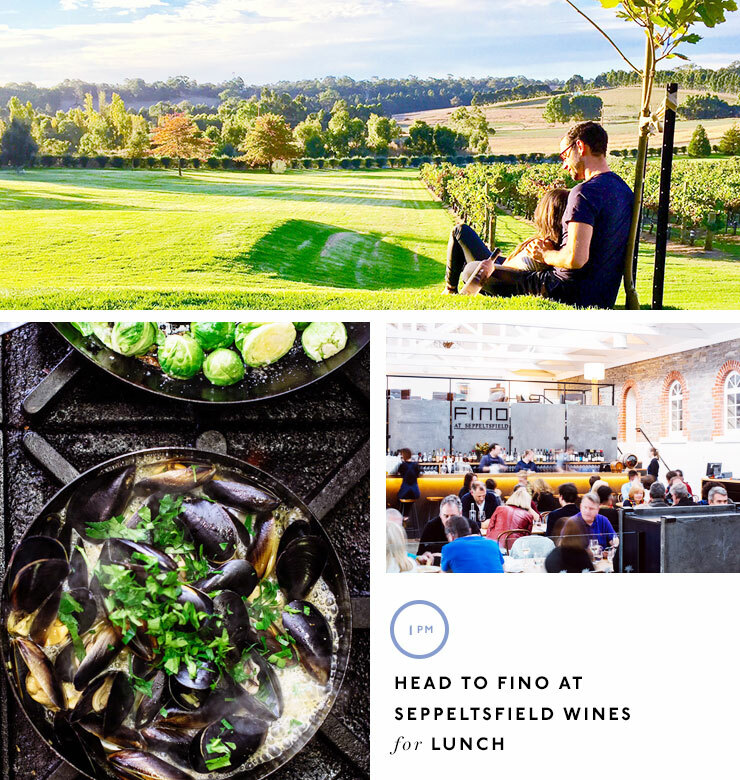 Then make your way to Hentley Farm for your degustation lunch (which you have booked ahead of time, you organised thing, you.) Head chef Lachlan Colwill creates menus according to whatever abundant, high-quality produce he finds their very own 150 acre farm. When you finish your flavour sensation of a lunch, head to Hentley’s cellar door for one of the most charming wine tastings you’ll ever experience. There is no standing at a bar, jostling for a position with other wine-tasters to get the pourer’s attention. Oh no, this is a little old cottage that has been converted into a cellar door, with each room having rustic tables and chairs that you take a seat at, with the lovely staff circulating the ‘house’ providing you with your tastings. Seriously, what a delight. 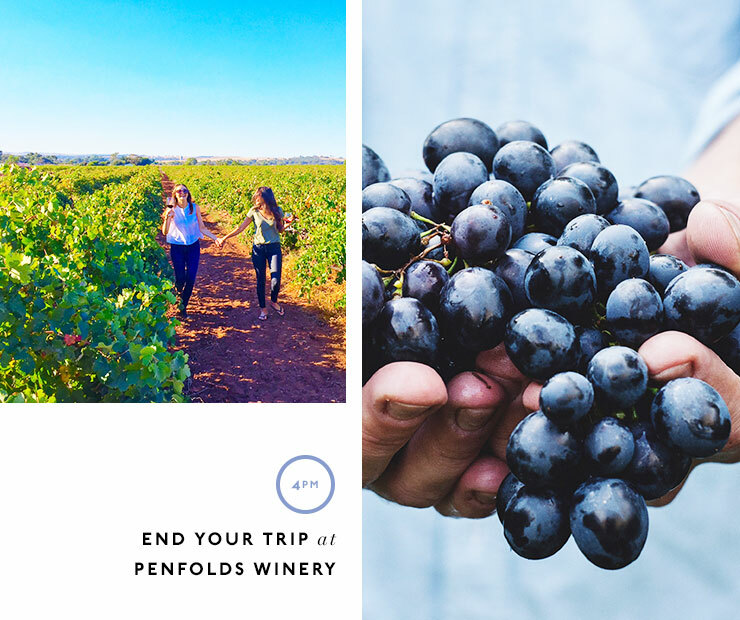 Round off your trip by visiting Penfolds—because you obviously can’t go to the Barossa without going to Penfolds. One of the most iconic wineries in the region and the country, Penfolds boasts more wines that you can comprehend, but don’t worry about being overwhelmed, because the staff are so knowledgeable and approachable they will guide you through all your tasting options. Want more? Check out how to spend a weekend in Queenstown.